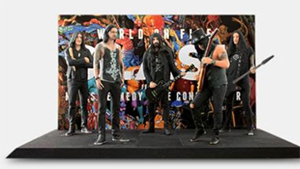 Action figures of Slash Featuring Myles Kennedy & The Conspirators, printed in photorealistic 3D via Staramba, are now available. These figurines can be purchased individually or as a set. The set also includes a plain black baseplate and background, an official artwork of the band's hit album World On Fire. The bundle comes in a lavish gift box that includes a Certificate of Authenticity and Care and Safety Instructions. Conspirator Todd Kerns commented, "It’s a very strange thing to have a figure of myself available out there. I’m the guy that has Johnny Ramone, Lemmy, Iggy Pop and Johnny Rotten jamming together on his dresser in action figure form. Strange times, brothers and sister. Strange and exciting times."